Hailey's Hope Foundation | Fiesta En La Playa Benefit – Honoring Edmund F. La Gamma, M.D. Over 125 guests came out to show their support for Hailey’s Hope Foundation and the evening’s honoree, Dr. Edmund F. La Gamma, at its “Fiesta en la Playa” benefit on April 30th at Manursing Island Club in Rye. Great Mexican cuisine, cocktails, raffles, and more set the stage for a fantastic and memorable night. The event raised over $85,000 for programs that bring hope, comfort and support to families struggling to cope with their baby’s hospitalization in the Neonatal Intensive Care Unit (NICU). 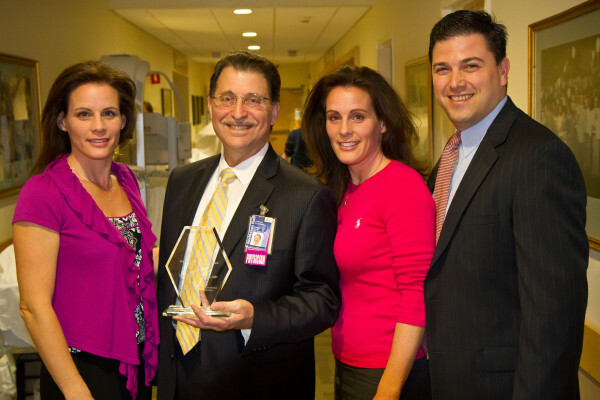 Among the evening’s many highlights was the presentation of the Hailey Zion Memorial Award for Community Spirit to Dr. Edmund F. La Gamma, Chief of Newborn Medicine and Director of the Regional NICU at Maria Fareri Children’s Hospital at Westchester Medical Center in Valhalla. Dr. La Gamma has been instrumental in creating and expanding access to an extraordinary, highly specialized hub of critical care for the tiniest and acutely ill newborns at the Regional NICU. His commitment, dedication and hard work have significantly impacted the survival and health of NICU babies and the lives of many NICU families. Another incredible moment was the introduction of the Duffy family, whose story brought tears to many eyes. Mr. and Mrs. Duffy’s son, Kevin, was hospitalized in the NICU for 118 days and had numerous transfusions and procedures, needed support from a ventilator, and survived a nearly fatal pneumonia. We would like to express our sincere appreciation to the evening’s generous sponsors. We are extremely grateful to all of the families and businesses who generously donated items for our Auction and Raffle and placed advertisements and greetings in our Reception Journal. Since our inception in December 2007, Hailey’s Hope Foundation has raised over $300,000 and provided financial and emotional support to over 500 families in Westchester and surrounding counties to help make their difficult NICU journeys a little easier to manage.